Keep track of time spent on multiple projects. Is there a better alternative to Time Check Pro? Is Time Check Pro really the best app in Applications category? 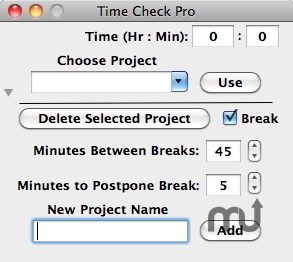 Will Time Check Pro work good on macOS 10.13.4? Time Check Pro needs a review. Be the first to review this app and get the discussion started! Time Check Pro needs a rating. Be the first to rate this app and get the discussion started! 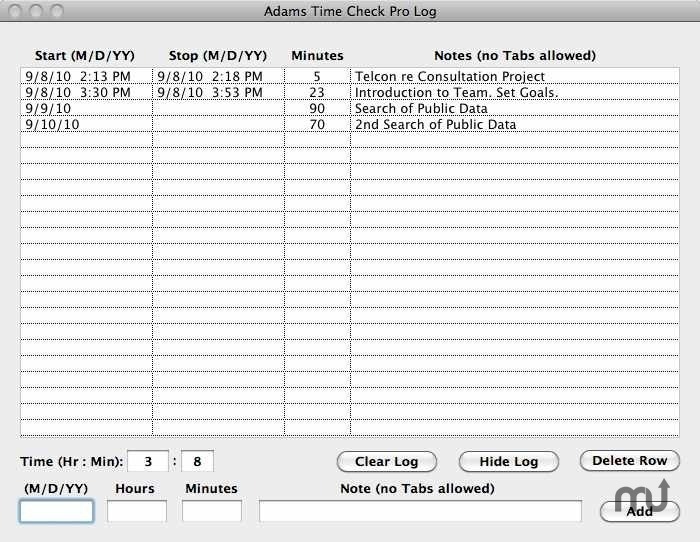 Time Check Pro (formerly Time Clock Pro) is a utility to help users keep track of time spent on multiple projects and provide reminders when to take breaks. An item is added to the menu bar to provide Time Clock Pro status and control. Messages from the app are presented in a pale yellow transparent layer on top of the display. Start Times and Stop Times are added automatically to the printable log (one per project) which also has room for short notes. Users can set the desired time between breaks. If not ready to take a break when prompted, the user can postpone the break before being reminded again and this time is also settable. Time Clock Pro allows fast and easy switching between projects. Settings, project running times and project logs are saved between sessions.